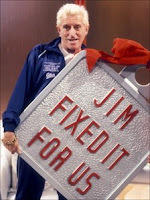 In his distinctive Yorkshire tones, the words "Now then, now then" meant Sir Jimmy Savile was getting down to business. He was on BBC television for nearly two decades from 1974 in his guise as a perennial Santa Claus, granting viewers' wishes from his magic chair on Jim'll Fix It. He personally helped the nursing staff at Leeds Infirmary and ran the entertainments section of Broadmoor high security psychiatric hospital. For more than three decades, Savile was most actively involved with the spinal unit at Stoke Mandeville Hospital in Buckinghamshire. He stayed there so often he had his own suite. Some questioned the motivation of the man behind such a singular public persona, but his energy and ability were beyond doubt. A self-professed loner, he nevertheless made an indelible impression on his audiences and, by virtue of his charity work, touched many lives. There is also a respectful video of the star, with the observation that he was an "enigma." The celebrity in question took part in Church events involving children, notably at Lourdes. Perhaps the Bishops might ask the BBC why they were not informed about the possibility of his being a risk to minors. Imagine the furore if the Church had supplied a priest for a children's programme on the BBC and failed to communicate a reasonable safeguarding concern. It has taken a media furore and dozens of allegations to drag the BBC reluctantly to admit that there might have been something wrong, that people knew about it at the time. Some Catholic bloggers have said that we must not gloat, and that is quite right. What I think we can do is to observe that the BBC has made, and is continuing to make a carbon copy of all the mistakes which Catholic Bishops made, and worse. At least some of the Bishops sent men for therapy, albeit in the mistaken belief that this would stop them from offending further. In the case of the BBC it seems that Savile's behaviour was dismissed as part of the "fun" culture and excused because he was such a jolly chap. So gloating, no. But a reasonable highlighting of breathtaking hypocrisy, yes, I think so. And the Bishops have a right to raise the question of why information relevant to the protection of children was not shared.